To me this image means a lot . It tells a short story in fact , of course one I would only be able to know . . but I’ll try to explain . Some times life can be really rough , it can leave you hurt – we all know that . We face many things . .including bullying – but that simple ‘ child phase ‘ they say , some times gets out of hand and leaves us bruised and bloody . [ Obviously note the bruises on the girls body . ] In my case anyways , it left me confused . . in a state of being lost ; I didn’t understand what I did that was so wrong to deserve all those horrible words they said or the hits they placed on me . 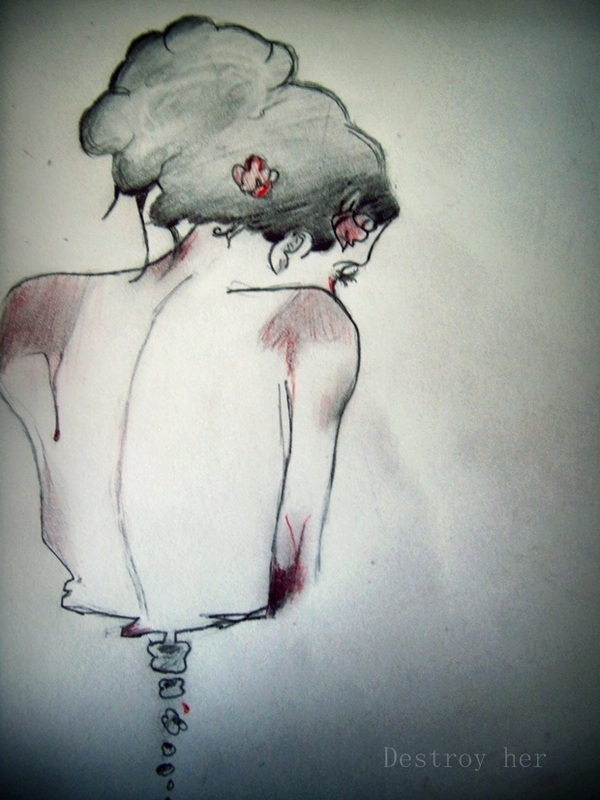 This girl . . in this rough sketch wouldn’t appear to you as ruined lost and hopeless ? Well not quite . . . There are red flowers resting in her hair , to me plants are a symbol of life . .Life – as long as there is life in you . . if you are still breathing there is a hope , a hope for a tomorrow and a better day – a hope that things WILL get better . & They will . . so don’t give up , hold onto your hope even if you fall down , no one can tear that believing from you . So don’t ever think that there is nothing left – you’ll rise against them and grow stronger through it all . . I over came it all – I’ve learned to love who I am and become happier now . Just keep your head high because there is not tax on dreams so dream big . . as big as you can and just fly with it.